Most retail and vendor organizations I have spoken to or interacted with in the past 6 months list at least one of the following objectives in their Corporate Strategic Plans: Collaboration. There is a big opportunity for Retailer and Vendor Collaboration, but organizations are not making any or enough progress. Shopper-Centricity. To win with Shoppers, Retailers and Vendors need to collaborate to be truly Shopper-centric. Limited collaboration is leading to misalignment of messages — meaning shoppers’ needs and wants are not being met. Big Data. 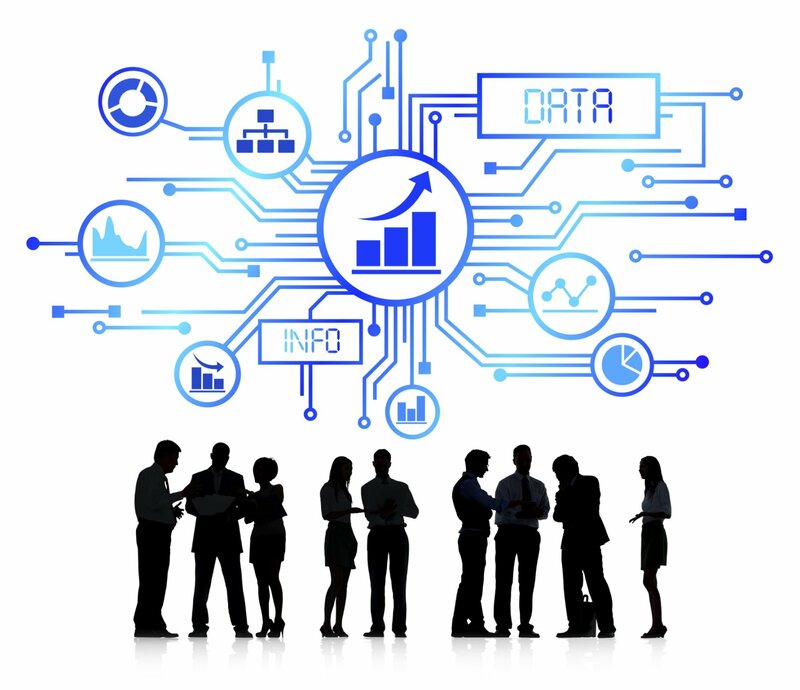 Leveraging Big Data (by Retailers or Vendors) requires more precision and sophistication in its use and is similarly aided by strategic collaboration between Retailers and Vendors. Progressive Grocer recently ran an article on “How Ineffective Promotions Are Dragging Down Top Consumer Packaged Goods Brands”. Pricing is one of the tactics of the Marketing Mix. It is an important marketing tool in retailing, and has become much more analytically- and strategically-focused than in the past. Prices vary based on different promotions, and on differing Retailer strategies. A difference of 5 or 10% in price can influence sales and profit significantly. 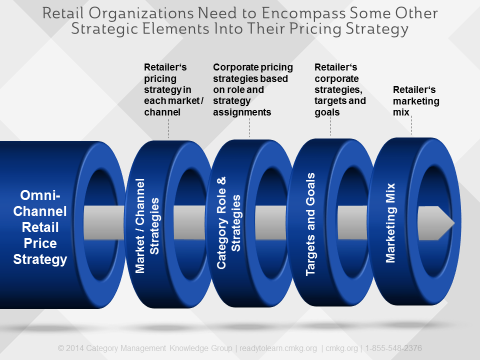 Pricing decisions directly affect category sales, inventory positions and category profitability. 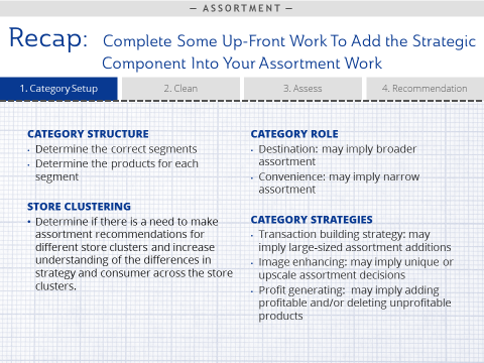 I was recently working with a large client on strategic efficient assortment and asked them what tools they used to complete their assortment analysis. Their answer? 1) “homemade” tools; and 2) item rank reports (yes, ranked in descending order and cutting off the lowest selling items). Honestly, I was shocked—how has such an important tactic (the most important one!) become so unstrategic? This approach gives little or no thought to Retailer strategy or the Retailer’s Shopper and their needs (it’s what I was doing for assortment analysis almost 25 years ago!). I think for some, assortment (and shelving, for that matter) have become too automated, too tactical and too low level. There’s so much time spent on the tactical work associated with maintaining homemade tools, managing item-level databases and pulling the right data that there’s no time left to incorporate very much strategy, Shopper or thought for trends into the recommendations. The opportunity? 1) Reduce the tactical work across your organization through proper tools and processes; and 2) Ramp up your efficient assortment analysis with a strategic Shopper focus and get a new level of insights and recommendations! Looking for some ways to improve your Excel skills to reduce errors, save time and/or take you to a new level of category management analysis? Excel is a great tool and necessary program for almost anyone in business to know how to use. But there’s always more to learn, faster ways to do things, shortcut keys, and helpful formulas. It can also waste an incredible amount of your time and be very inefficient without utilizing Excel’s powerful features through a solid understanding. If this sounds familiar, you are not alone — there are a lot of people in this camp because many of us have learned on-the-job rather than through training. The opportunity? Learn more effective Excel skills, save time and frustration and transform yourself into an Excel rockstar! Being able to analyze data and derive relevant insights from it is a requirement in almost every role for both Retailers and Suppliers. There’s an opportunity for many in our industry to learn how to make fact-based, strategic decisions and recommendations by building skills to effectively read and interpret data. 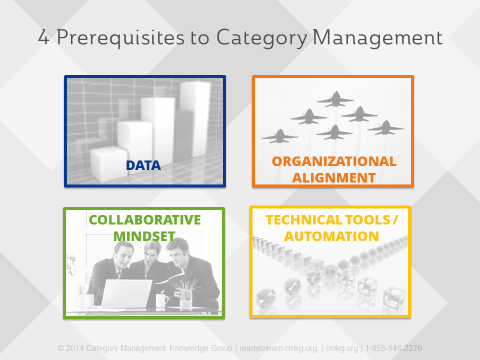 A great starting point for learning how to do this is through a category assessment. 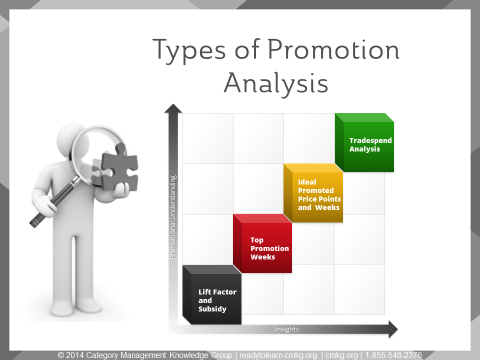 Creating a category assessment is also the first step in developing a retail category plan, but the flow, measures and logic apply to development of category reviews, business reviews and internal planning documents. 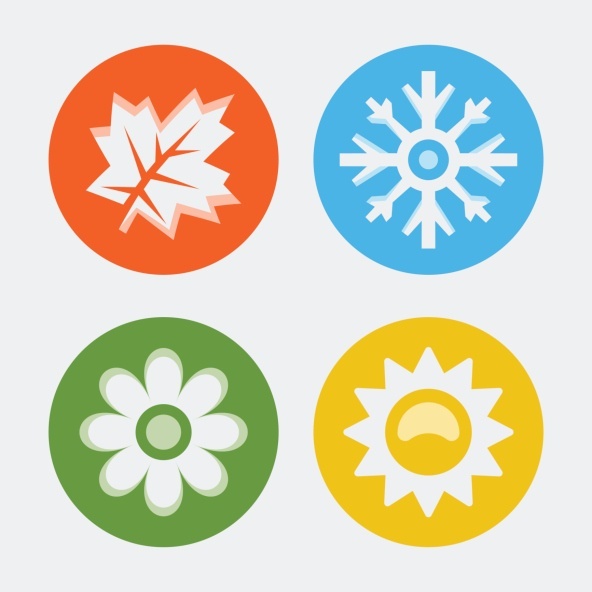 You should be able to analyze, benchmark, interpret and identify strengths, weaknesses, opportunities and threats through an effective category assessment.